Nakajima, K., & Suzuki, M. (Eds.). (1997). 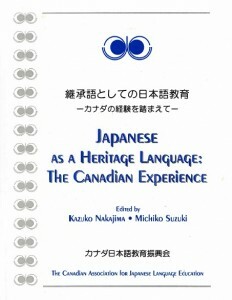 Japanese as a Heritage Language: The Canadian Experience (Canadian Association for Japanese Language Education). Welland, Ontario: Éditions Soleil. This volume contains an introduction to the new emerging field “Japanese as a heritage language (JHL),” together with a report of the first national JHL symposium funded by the Department of Heritage of the Federal Government of Canada and the results of the survey of JHL schools and programs in Canada. This publication also includes five essays from the major JHL players in Vancouver, Calgary, Toronto, Ottawa and Montreal, five JHL research papers, JHL Teacher’s Guide, as well as JHL sample lesson plans based on the Generic Curriculum for Heritage Language Program published by Toronto Board of Education in 1994. Canadian Association for Japanese Language Education. (2000). Oral Proficiency Assessment for Bilingual Children. Toronto, Ontario: Canadian Association for Japanese Language Education. 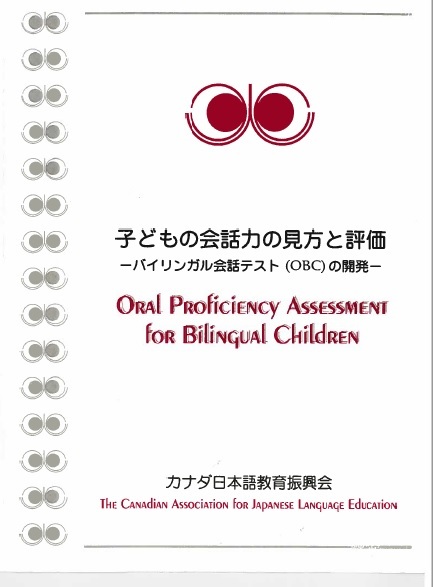 The Oral Proficiency Assessment for Bilingual Children (OBC) has been developed by interested CAJLE members since 1991 for young JHL (Japanese as a heritage language) speakers ages 7-14. The project received the ‘heritage language’ research grants of the Government of Ontario during 1992-1994. This tool is intended to help diagnosing the child’s bilingual development in three domains: (1) how well the child can respond to the tester’s questions, (2) how well the child initiates the conversation and concludes it, and (3) how well a child tells his or her story or presents an explanation or an argument. This volume contains the theoretical background, practical guides for administering the OBC with flowcharts and picture task cards in each language, and finally, scoring and evaluations. For more detailed background, please refer to: Nakajima, K., Suzuki, M. and Oketani, H. (1994) “The Development of Oral Proficiency Test for Young Learners,” Nihongo Kyoiku Vol. 83, pp. 40-58.